The diagram shows all the possible rhythms within one beat using groups of 5. The noteheads are meant to be played/clapped, and the sticks without heads are supposed to be felt. Practise each rhythm individually until you feel like you’ve got it nailed. If you’re up for a challenge, practise them with the metronome click on the second, third, fourth or fifth quintuplet. That’s a great way to work on making your time stronger, and your rhythmic placement very accurate. Another exercise that’s good for sight-reading/rhythm/concentration practice is to randomly skip through the rhythms in time. 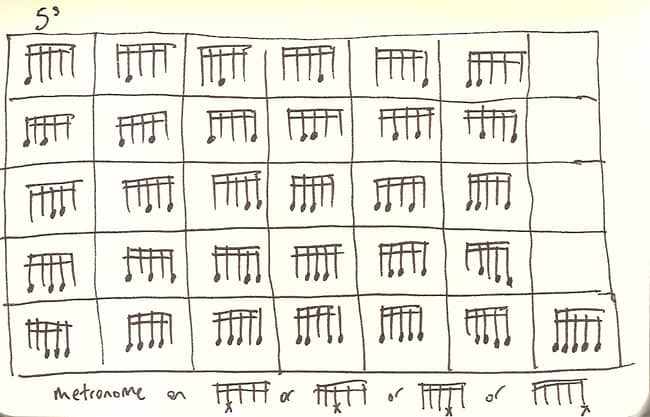 At first, try doing four of one rhythm (that’ll be a bar of 4/4) before randomly skipping to another box, do four more. Work it up so you can randomly skip around but doing one box per beat.